The Big Idea: The smallest, simplest things—like coloring together—provide the best opportunities for quiet bonding, conversation, relaxation, collaboration, and praise. For both adults and children, coloring can help reduce stress. This adult-child collaborative coloring page promotes relaxed time together. As you color, try paying attention to the details of the design, the sensation of the pencil on the page, and encourage children to do the same. 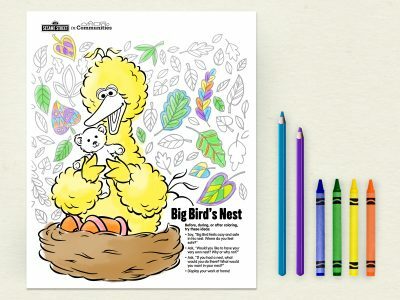 This collaborative coloring page can help adults communicate important ideas without saying a word: We can relax together. We can have a good time together. We can concentrate. I am here with you. I am listening. I am interested in you. We can share feelings. We can make something beautiful, even when the world around us feels ugly. Sit side by side with the child, in a quiet space with a surface. You might put on music you both like. Kids color the large Muppet image, adults color the more detailed background. Show pride in your child’s accomplishment. Help them remember the time you spent together by displaying the completed page. Display your work at home!